Music is a core part of our worship at St. Peter’s. As Christians we have always found ways to say and sing the story of God’s kingdom and its transformative power in our world. Here at St. Peter’s, music continues to be an important part of God’s service and always seeks to show forth Christ through the varied hymns, psalms, and spiritual songs we sing as a gathered community. Additionally, small groups gather weekly from September to May to prepare to lead worship. At St. Peter’s the hymns, songs, and spiritual songs we sing as a congregation are a strong part of the worship service. By raising our voices collectively in song, we communally proclaim our faith. Each of our voices melds with the others around us, and together, as the assembled people of God, we proclaim God’s word of grace to each other and to the world. We sing many different kinds of music from a variety of cultures, led by the organ and piano or sometimes sung a cappella. All are welcome to join the vocal choirs at St. Peter’s. A list of current opportunities is listed below. Questions or requests for more information may be directed to the Director of Music. Providing vocal leadership at the 8:00am service approximately once a month, this choir is for adult voices and rehearses in the music room between services on the last two Sundays of the month. Music is primarily in one or two vocal parts and is easily learned in one or two rehearsals. Providing weekly vocal leadership at the 10:45am service, this choir is for adult voices and rehearses in the music room on Thursday evenings from 7:30-8:30pm. Music is usually divided into three or four vocal parts. Providing vocal leadership approximately once per month, this choir is for girls and boys in grades 1 through 5 and practices in the music room on Thursday evenings from 6:00-6:30pm. Rehearsals focus on learning to read music and development of musicianship and worship leadership skills. 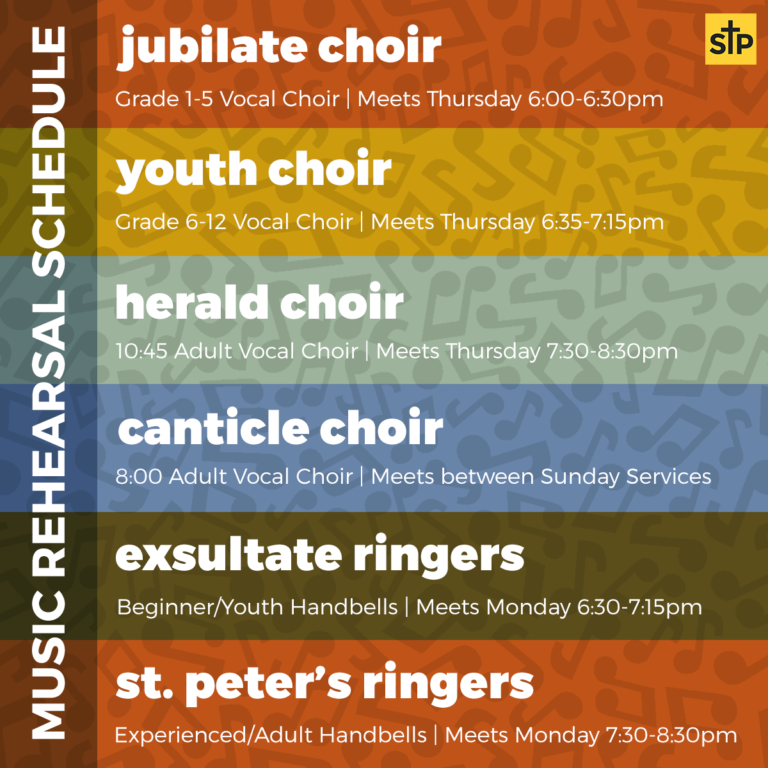 Providing vocal leadership approximately once per month, this choir is for young men and women in grades 6-12 and practices on Thursday evenings from 6:35-7:15pm. Music is usually divided into two or three vocal parts. Providing musical leadership at funerals and memorial services, this choir is for anyone who is interested and available during the day. Rehearsals are held 3-4 times periodically throughout the year. Contact the Director of Music for more information. Ringers of all ages are welcome to join the handbell ensembles. Questions or requests for more information may be directed to the Director of Music. Providing musical leadership approximately once per month, this ensemble is for individuals who consider themselves beginning ringers. This intergenerational bell ensemble practices in the music room on Monday evenings from 6:30-7:15pm. 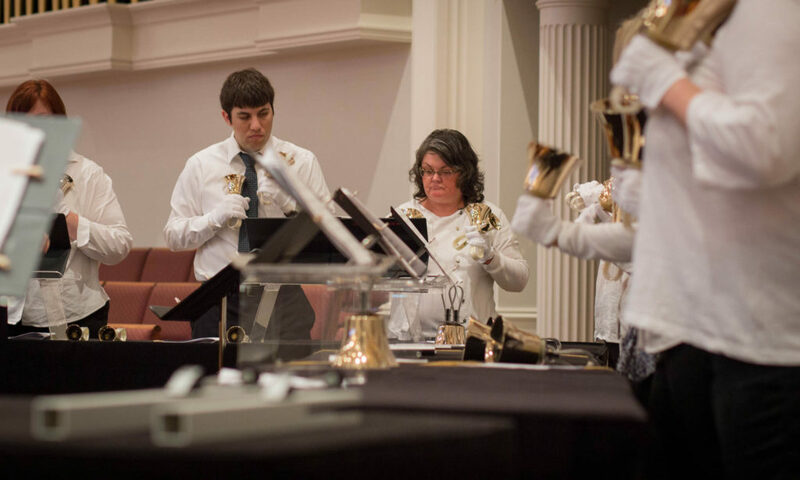 Music is of an appropriate level for current participants and an emphasis is placed upon learning handbell techniques. Providing musical leadership approximately once per month, this ensemble is for individuals who consider themselves experienced ringers. This ensemble practices in the music room on Monday evenings from 7:30-8:30pm. Music is of an appropriate level for current participants and an emphasis is placed upon developing musicianship. On occasion, smaller groups of ringers gather to provide leadership for services. Individuals do not have to be current members of one of the above choirs to participate in these ensembles. Interested ringers may sign up below. 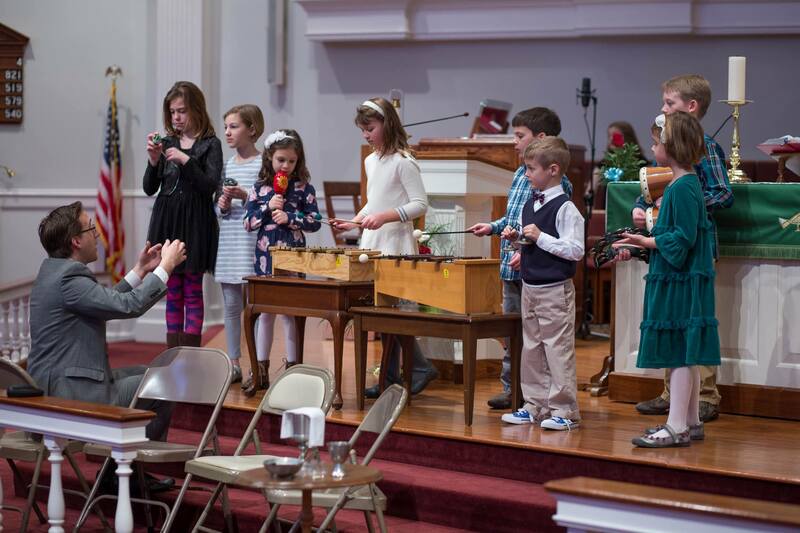 On occasion, congregational members who play musical instruments or sing may choose to participate in services as a soloist or in a musical group. Interested musicians of all ages are encouraged to sign up below. Our New Day Praise Service meets weekly at 10:45am. A live band provides accompaniment for contemporary worship music. Singers and instrumentalists are welcome! Would you like to share your gift of music in worship? Fill out this form to let us know what you’re interested in.